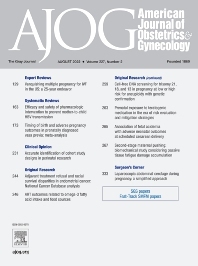 The American Journal of Obstetrics and Gynecology, “The Gray Journal”, covers the full spectrum of Obstetrics and Gynecology. The aim of the Journal is to publish original research (clinical and translational), reviews, opinions, video clips, podcasts and interviews that will have an impact on the understanding of health and disease and that has the potential to change the practice of women's health care. An important focus is the diagnosis, treatment, prediction and prevention of obstetrical and gynecological disorders. The Journal also publishes work on the biology of reproduction, and content which provides insight into the physiology and mechanisms of obstetrical and gynecological diseases.